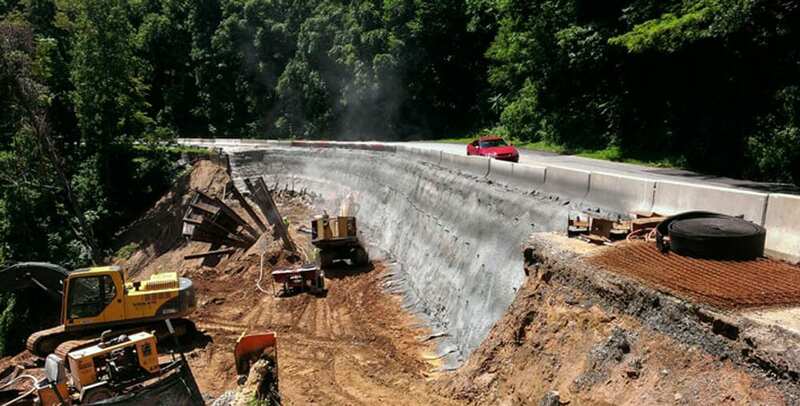 Using tensile elements to stabilize landslides is both effective and cost efficient. However, the process of installing tensile elements in actively moving landslides challenges traditional technologies. For example, conventional drilled soil nails (originally developed to stabilize unfailed cut slopes and excavations) are not generally suited for landslide repair. The Federal Highway Administration, in their Geotechnical Engineering Circular No. 7 (Soil Nail Walls), notes that the “application of [conventional solid bar] soil nails as a means to stabilize landslides is not often used in the current U.S. practice and is therefore not discussed in this document.” Collapsing holes, active ground movement, and grout loss and migration are some of the primary problems with using these kinds of conventional technologies for geohazard mitigation. To solve this problem, GeoStabilization International® founders and engineers developed and patented the SuperNail™ series of tensile elements. These launched nails, as specified in the Supernail™ services, can be installed faster than any other soil nail technology (over 250 20-foot nails per day is possible) and some types of nails can be installed using specialized drilling techniques. Unlike conventional solid bar soil nails, the GSI® nails can be installed in collapsing holes, areas with voids, actively moving landslides, and at depths of up to 120 feet in soil, rock, or a combination of soil and rock. Depending on the design services specified, anywhere from 1-4 layers of corrosion protection will protect the tensile element for permanent application. In very aggressive soil conditions or coastal environments, GSI® can also use fiberglass instead of steel to construct SuperNails.